Exploring any of the world’s five bioluminescent bays, like the one I recently visited in Vieques, Puerto Rico, called Mosquito Bay, is an adventure. When done right, you’ll be dazzled by the millions of illuminating microorganisms that thrive in brackish water. But when you do it the wrong way, it can easily become a disappointing mosquito-bite fest. You’ll need to know a few tricks in order to take your night in a bio bay from mediocre to once-in-a-lifetime. 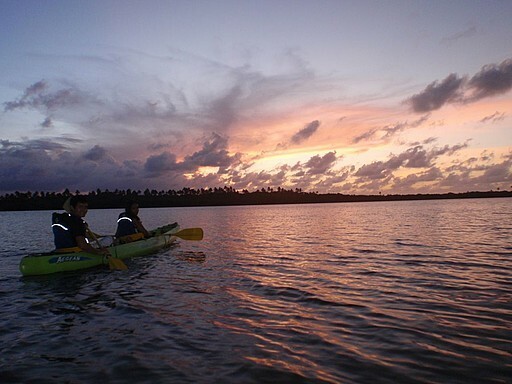 Here’s how to see a bioluminescent bay and leave with nothing but glowing reviews. A little research is usually your best friend when it comes to travel, but Googling images of bioluminescent bays is definitely not going to help you enjoy the real thing. What most people don’t realize is that most of the photos you see of these bays online are essentially fake. Bioluminescent microorganisms are single-celled bacteria called dinoflagellates that can only glow for an instant (less than one second) every 24 hours or so. There are millions of them in the bay, which allows for the water to glow when it’s disturbed. This means that the only way to capture a photo of the bioluminescence on camera is to use a tripod and take a long-exposure shot, capturing the millions of tiny millisecond-long glows that make up the illumination. Most images are not simply long-exposure. They’re doctored to look like the water glows outright in the dark. Another factor in bioluminescence is the amount of moonlight on the bay during your tour. While the gibbous moon that was out on our partly-cloudy night allowed for an enjoyable sight, a large full moon on a clearer night might have made it a bit more difficult to spot the green/blue glow. There are five bioluminescent bays in the world: Luminous Lagoon in Jamaica, Halong Bay in Vietnam, and Puerto Rico’s Laguna Grande, La Parguera, and Mosquito Bay. Mosquito Bay is currently the brightest. If you’re planning your trip to any of these bays far enough ahead of time, plan your expedition to land on the night of a crescent or new moon. In addition to some great memories, I left Mosquito Bay with a lot of bug bites. This was my own fault for trusting some bogus advice: I’d read that nothing artificial was to be worn in the bay. Sunscreen, harsh lotions or perfumes, and bug spray were apparently not allowed. Bioluminescent bays around the world have been fading, but Mosquito Bay has been revived in the past year in part thanks to a ban on these products. What I didn’t realize, because I didn’t confirm ahead of time with my guide, is that non-DEET bug spray is welcome and could have saved me the days-worth of discomfort that followed. Another tip: Wear long sleeves and pants to protect your skin and keep you warm after the sun goes down. Most adventure excursions in Puerto Rico require athletic footwear. If you’re interested in seeing the islands’ mountainous rainforests, good shoes or boots are a must for the hiking, climbing, spelunking, and body rafting you’ll likely want to do. Because water shoes can collect sand and sharp rocks, I was urged to simply wear my Nikes in the water. And I did. This excursion, however, does not require hiking. I arrived prepared for a trek to the bay, which lay beyond a thick forest of mangrove trees, but discovered that most tour companies will load participants in off-roading trucks to take them right to the water’s edge. Simple water shoes or even flip flops will do for hopping in and out of the shallow water. I, however, found myself in a kayak with cold, wet socks and sneakers, wishing I hadn’t destroyed my favorite running shoes. The view of the bay while you’re out on the water is breathtaking—when else will you get to explore glowing Caribbean waves past dusk? You’ll want to lean back for a break from paddling to stargaze, but what’s easy to miss is below the seemingly black water. If you look beneath the shadow your kayak makes on the water, you’ll see radioactive-looking fish flitting around below the surface. In some spots I could see what seemed like hundreds of fish passing below me in a school, and they were all glowing as they moved through the water. The time out on the water will fly by once you start exploring the sights around you, so make sure you take it all in before your time is up. The magic of Vieques’ bioluminescent bay more than made up for the mosquito bites.